LG has launched nine apps for its range of Internet-enabled TVs that attempt to bring more of the Web to your TV. Although not exactly anywhere as comprehensive as Google TV’s offering, LG’s apps bring such things as the BBC iPlayer, Google Maps, Facebook and Twitter to your LG TV, which at least makes your TV 1,000 times smarter than it was before! Better still, it won’t have the political hurdles that are currently stalling Google TV’s growth, and all the apps are available now. Google TV is having problems at the moment because the major networks in the US are refusing to allow their channels to be shown on Google TV. 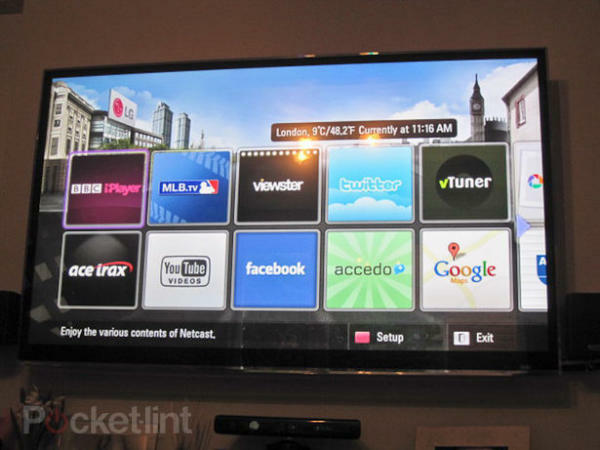 This leaves the Google TV service as a browser and YouTube player for your TV – which is still fine in my books! – but annoyingly prevents the platform from offrering the unified Web AND TV service we were all hoping for. Inevitably this will all be ironed out in due course. In the meantime, limited app-ready TV services such as LG’s, which don’t offer you the whole Web, but still offer you just enough to actually be useful, have a t least a foot in the door until Google TV or equivalents are finall yable to persuade the major TV companies that their content is safe.